I have a lack of Father's Day wrapping paper, so I made my own and got my sister's input for design ideas. This was one of the decorations that ended up on the wrapping paper. Once upon a time, my family lived in a house in Oklahoma that had a comfortable, functional kitchen. And one night my mom wasn't around, so it was up to my dad, my sister, and I to make dinner if we wanted to eat. I was somewhere between the ages of 5 and 9. My sister Mikayla was somewhere between the ages of 2 and 6. We weren't exactly the best chefs. But on that night, we were going to make dinner. By ourselves. I don't remember exactly how this was decided, but I have a feeling it was my dad's idea. It was probably meant to be an educational experience. I remember suspecting laziness as a motive. It wasn't a difficult meal- it was just Kraft Macaroni and Cheese. We'd seen our parents make it before, and there were directions on the box. But let's be honest, here- using the stove can be kind of a daunting task for a- shall we say, eight-year-old and five-year-old? We did our best to get started, but it wasn't long before I found myself unsure of how to proceed. I turned to my dad, who was lurking by the fridge behind us, to ask him a question. He replied that he wasn't really there; he was the Safety Ghost, who would make sure that my sister and I didn't hurt ourselves or set the kitchen on fire, but he couldn't provide any advice or assistance. Because he was just the Safety Ghost. I remember being annoyed. I remember none of my attempts to get help working. I don't remember how the macaroni and cheese actually turned out. But I know the kitchen never caught fire that night. Although it was infuriating at the time (SERIOUSLY, JUST ANSWER THE QUESTION! ), it makes me smile to look back on my childhood and think of all the times the "Safety Ghost" supervised my sister and me in the kitchen or other projects. I'm glad my dad trusted us enough to let us try some things on our own. I'm glad he wanted us to learn how to do things and figure out how to problem-solve starting at a young age. The first appearance of the Safety Ghost is the most vivid in my memory. I asked my sister if she had any good stories to share with the Internet, and she said I should talk about the time Dad was supposed to be the Safety Ghost for my Rube Goldberg project in high school but ended up practically taking over the project because he just couldn't help himself. The man loves a good project. All jokes aside, thanks for letting us use power tools, Dad. Not all little girls had dads who would let them help out with building furniture or constructing holiday decorations, and it means a lot to me that I was allowed to try my hand at building things. Those experiences helped me become the crafty, creative, resourceful person I am today! So thanks for letting us get our hands dirty! Thanks for pushing us out of our comfort zones! I still think you were just being lazy sometimes, but it worked out all right in the end! 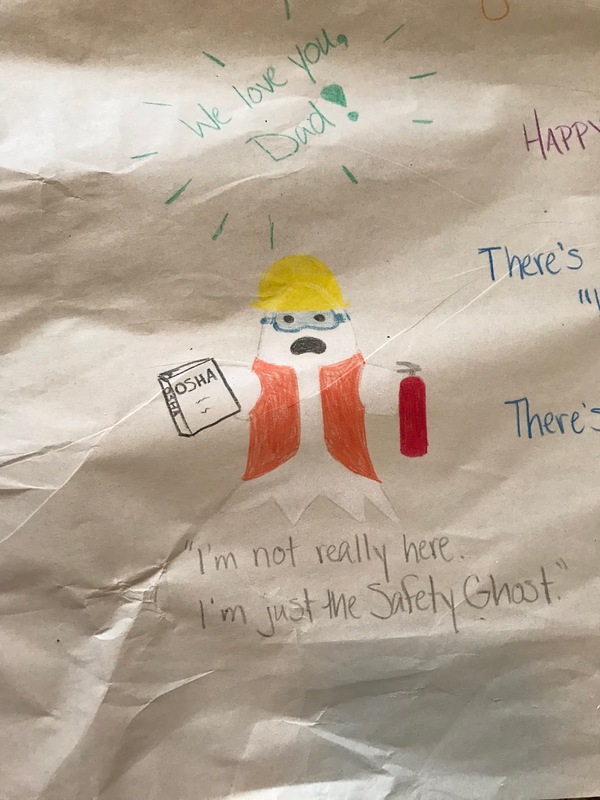 Happy Father's Day, Safety Ghost!